G H Raisoni College of Engineering, Nagpur has advertised in LOKMAT newspaper for the recruitment of Teaching Faculty- Professor / Associate Professor / Assistant Professor jobs vacancies. Interested and eligible job aspirants are requested to walk-in on 21st June 2018. Check out further more details below. About College: G.H. Raisoni College of Engineering (GHRCE) Nagpur, established in 1996, is an autonomous institution affiliated to Rashtrasant Tukadoji Maharaj Nagpur University. The institute became autonomous in 2010 for a period of six years till 2016 and UGC has renewed autonomous status till 2022. It is ranked 67th PAN India in Engineering Discipline as declared by National Institutional Ranking Framework (NIRF) 2017, MHRD, Government of India. First class at both UG and PG level for Assistant Professor jobs. Ph.D is a must for those who are appearing for Associate Professor Jobs and Professor Jobs. How to Apply: Interested and eligible candidates are requested to walk-in with prescribed format & CV accompanied with all attested photocopies of certificates of qualification from class 10th onwards, experience & testimonials and all originals for verification purpose. The walk-in venue is given below. 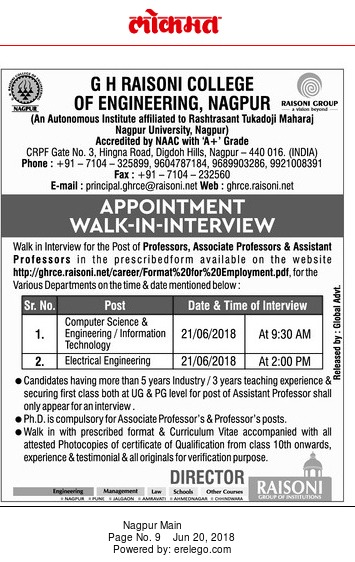 Reference: Advertisement from G H Raisoni College of Engineering, Nagpur on LOKMAT newspaper dated 20th June 2018 for the recruitment of vacancy position such as Professor / Associate Professor / Assistant Professor faculty jobs. See the copy of advt below.